Adversity. Every team faces it in some form or another. The teams that handle that adversity tend to have success. The 4-1 loss to Finland Wednesday puts the U.S. in a situation in which it has to win at least one of its next two games to advance to the medal round. 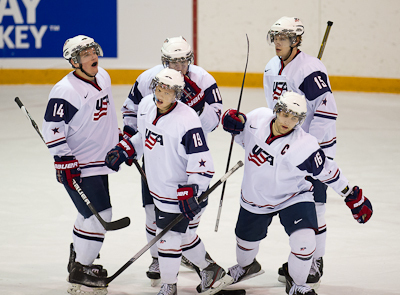 The U.S. gets a chance today against a feisty Team Czech Republic at 3:30 p.m. EST. The Czechs and Americans are both 1-0-0-1, so there’s a lot on the line in this game. The Czech Republic is coming off a 5-0 loss at the hands of the Canadians, despite a valiant effort in net from goaltender Petr Mrazek. With a good goaltender and pretty decent skill throughout the lineup, the Czechs may not be at the same level of Finland, but they’re not far off. The U.S. has to be sure not to take this very capable opponent lightly or get caught looking ahead to Canada. With so much on the line, I wouldn’t anticipate Team USA sleeping on its third preliminary-round opponent, especially coming off of a stunning loss. If the U.S. isn’t playing with a bit of an edge in today’s contest, then it’s a concern, but I don’t see that happening. A full preview of USA-Czech Republic continues after the jump. As of this writing, there was no update on the status of forward Connor Brickley, who sat out the Finland game with an injury. At the time of the injury, which was suffered via a skate blade in the Denmark game, it was not thought Brickley would miss much time, but it’s one of those injuries that’s tough to predict. Brickley’s the type of player that brings energy to the lineup and helps establish a physical presence. Getting him back would provide some spark to a forward lineup that had trouble going to the hard areas of the ice. The U.S. could certainly use him, but if he’s not 100 percent, another day of recovery might not hurt with the very physical Canada looming. Dean Blais also has not confirmed who will be in net for the U.S. tomorrow. One would have to expect Jack Campbell to be back in goal. I’ll still maintain that the blame cannot be heaped entirely on John Gibson for the 4-1 loss to Finland, but Campbell has proven himself on the World Junior stage in back-to-back years. In a pressure-packed must-win game, Campbell has proven he can do the job. One would have to expect we’ll see another shuffling of the lines prior to this game. Several different combinations were used against Finland, particularly in the third period. We’ll see if Blais elects to go back to the lines from the Denmark game or if there’s going to be some more new combos. Adding Emerson Etem to the line of Charlie Coyle and Brandon Saad helped the U.S. score a goal and that line had some more jump. Jason Zucker was on that line in the exhibitions and at least to start each of the two WJC games. His ice time went down in the third as he struggled to get it going. It’d be interesting to see if Etem sticks with Coyle and Saad, or if Zucker’s back. The line of Kyle Rau, Austin Czarnik and Josh Archibald looked good on several shifts offensively, but struggled in the defensive zone, which was most obvious on Finland’s first goal. That line had two goals against in the game, so it wouldn’t be shocking to see a shakeup there as well. Based on the way he’s played through two exhibitions, you’d have to expect T.J. Tynan to see the ice a little more against the Czechs. He provided a spark on many of his shifts against Finland and at times looked threatening offensively. He just needs to find a way to finish plays in order to round out his excellent play. Jarred Tinordi and Jon Merrill should see the ice an awful lot for Team USA on the blue line. The lack of defensive depth was evident against Finland and a series of mistakes from guys on the back end were confidence-shaking. Still, at the top of that lineup, the U.S. has some good, dependable guys like Merrill and Tinordi. It would also seem that Jacob Trouba is going to see a little more ice in this next contest after bringing his physical game and showing off some mature play against Finland. The Czech Republic defeated Denmark 7-0 and lost to Canada 5-0, but as Finland just proved on Wednesday, what happened in previous games means absolutely nothing in today’s game. The Czechs have as much to play for as the Americans, so expect a great effort from Team USA’s opponent today. There’s some good skill up front for the Czechs, combined with good size. Then there’s Mrazek who could be the X-factor. The Ottawa 67s netminder has been good in his two starts, even in the loss to Canada. Mrazek has made 45 saves through two games, posting a .900 save percentage and 2.50 goals-against average. The U.S. ran into Sami Aittokallio, who was rock solid in Finland’s 4-1 win, but never had to make many show-stopping saves. If the U.S. is going to have success against the Czechs today, they have to make Mrazek work. He’ll make the easy saves, so the U.S. has to generate more chances from those prime-scoring areas. Getting to the net is a priority after Team USA struggled to own the middle of the ice against Finland. The Czechs have some really nice size on defense, led by 6-foot-4 Vancouver Giants defenseman David Musil. Regardless of size, the U.S. has to pay the price for offense. That requires an aggressive forecheck, taking some punishment in front of the net and capitalizing on the chances their given. If Blais does end up doing a bit more line juggling, it’s going to be up to the players to find a way to come together. These guys should be good enough to be able to adapt and find a way to play with anyone. It’s easier said than done, but when you’re playing in a short tournament, it has to happen quickly. The U.S. simply has to play the game their capable of playing. The speed and physical aspects have to be better, mistakes limited and goaltending strong. Team USA has an opportunity to respond to the adversity of losing early in the tournament. Was the loss to Finland a turning point or just the tip of the iceberg? We find out at 3:30 today. USA Hockey’s game notes for USA-Czech Republic. Team USA’s stats through two games. Jacob Trouba might be 17 years old, but he’s hardly playing like it. Dean Blais and Trouba talk about how the youngster has played in Edmonton so far and what makes him successful with USAHockey.com. Coming Down the Pipe has a series of posts worth linking here today. Some good insight into the Czech’s 5-0 loss to Canada. A Finland-USA recap with many quotes from players and staff. A good feature on Austin Czarnik. USofH on the Air: I joined the Youngstown Phantoms’ weekly radio show, Behind the Glass Tuesday to chat about Team USA and the impact of the USHL on the World Juniors. Just prior to the tournament, I spoke with Brian Kom of DobberHockey.com for a look at Team USA. If you’re a Team USA fan and you like to laugh, The Sleeping Giant has been bringing it this World Junior season. Bob Duff of the Windsor Star profiles the National Team Development Program. After its 10-2 win over Denmark, all that’s left for Canada is the game against the U.S. Expect the tale of Jamie Oleksiak choosing Canada over the U.S. for his international hockey allegiance to played up a lot over the next 24 hours. It starts here. If you didn’t know, Russia’s Yevgeni Kuznetsov is really, really good at hockey. He put up nine points against Latvia Thursday night, good for second most all time in World Junior history. The only man ahead of him? Peter Forsberg, who put up 10 against Japan (?). The U.S. National Under-17 Team opened play at the World Under-17 Hockey Challenge Thursday night with a 5-1 win over the Czech Republic. J.T. Compher and Evan Allen each had two goals, while Steve Santini had the other. Hunter Miska and Thatcher Demko split time in the net. Miska made eight saves in the first period, while Demko stopped 15 of 16 in the closing 40 minutes. Allen was named Team USA’s player of the game and was very deserving. He was all over the ice making things happen. Overall it was a great way to start the tournament, as the U.S. out-shot the Czechs 56-24. Team USA will meet Russia at 2 p.m. EST today in Windsor. I won’t be tweeting during the USA-CZE game, but if you have questions before, during or after, I’ll get to as many as I can post game. Expect a full reaction to the U.S. game this evening and a whole bunch of USA-Canada coverage Saturday. Today’s game will tell you everything you need to know about this team. The great thing about hockey is you always get another chance at redemption.